The escalation of tensions between Moldova and the break-away Transnistria region is causing concern in the EU and neighbouring Romania. Growing dispute between parties started by unilateral actions by both parties during this Spring. First Moldova established migration control of citizens in six checkpoints, second Transnistria started to mark border in in the sc Security Zone or line of demarcation after the Transnistrian war (1992). Transnistria – also known as Transdnistria aka Pridnestrovie aka Pridnestrovskaia Moldavskaia Respublica (PMR) – is a new and emerging country in South Eastern Europe, sandwiched between Moldova and Ukraine. Moldova is one of the frontlines of “battlefield” of interest spheres between EU and Russia, between U.S. and Russia and between future energy political deals. It is also a test for international law, conflict management and territorial sovereignty. From Moldovan point of view Transnistria’s actions would expand the separatist region to include eight Moldovan villages. There is heightened fears in region of a military confrontation with Moldova, but in my opinion this can be avoided. The present round of changes started already on March 2013 in particular, the Republic of Moldova unilaterally decided to establish migration control of citizens in the six checkpoints: Gyrbovets (Novye Aneny), Khadzhimus (Kaushany), Dubossary, Kriulyany, Rezina, Seneteuka (Floreshty) without proper coordination at the bilateral or multilateral international level and within the framework of the Joint Control Commission. (Source PMR FA) The decision imposes limitations on the citizens of Russia, living in Transnistria (about 150 thousand people) and forming one-fourth of Transnistria’s population. The Moldovan authorities said they did it in order to establish order on the future eastern border of the European Union, which Moldova plans to join. Moldova itself has been marked by political turbulence in recent years. In Chișinău, there is a big fight, for money and power.The constant power struggle left Moldova without a president for nearly two years, then without a prime minister, and then also without a speaker of the Parliament. Earlier this year there was the collapse of Moldova’s pro-European governing coalition. In 2011 presidential elections President Igor Smirnov, who had been in power since Transnistria declared independence in 1990, was replaced by opposition MP and former speaker of the Supreme Council Yevgeny Shevchuk. Earlier President Shevchuk, made a startling proposal to move the region’s legislature, the Supreme Council, from Tiraspol to the territory’s second-largest city, Bender. The choice of Bender was clearly symbolic: the city is the site of one of the bloodiest battles in the 1990s war that ended with Transnistria declaring independence from the Republic of Moldova. The proposed move would also take the significant step of carrying Transdniester’s political center of gravity across the Dniester River, which geographically separates the bulk of the breakaway region from Moldova proper. Bender is one of the few regions on the Dniester’s western bank that is under Transdniester’s de facto jurisdiction. Bender also lies within the security zone established after the war, a narrow strip that includes Transdniestrian and Moldovan exclave territories on both banks of the river. The terms of the 1992 cease-fire agreement prohibit either party from taking actions that would deliberately aggravate tensions between the two sides. In this light, the Bender proposal has been interpreted by some as the kind of land grab that has been seen in other territorial conflicts in the former Soviet Union and the post-war Balkans. Supreme Council lawmakers rejected the proposal on May 23, voting to pass a resolution stating that the Transdniestrian parliament should remain in the territory’s de facto capital, Tiraspol. One should however emphasize that the power changes in Transnistria give positive boost to peace process: the official negotiation process re-started after six years interruption in November 2011 in Vilnius, Lithuania, to be followed by a meeting on February 2012 in Dublin, Ireland and on April 2012. Finally the Document of principles and procedures and agenda of negotiations were agreed in Vienna, whereas on July 2012 this Document was signed. It included such issues as freedom of movement of passengers and cargo, traffic of trains, education issues,etc. Now the progress seems to go backwards. Moldova was part of Romania before the Soviet Union annexed it in World War II. Before the First World War it was part of Tsarist Russia. 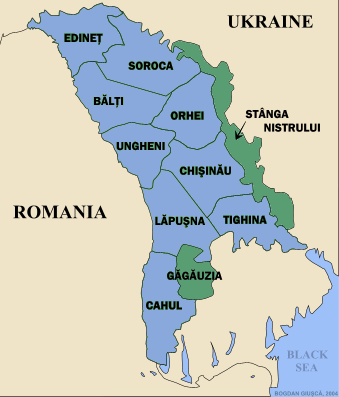 A landlocked country lying between Romania and Ukraine, most people speak Romanian, although the country’s constitution calls the language Moldovan. Moldova became independent in 1991. Moldovans share a linguistic and historical heritage with Romania. Although widely seen as part of Moldova, historically, Transnistria and Moldova were always separate. Throughout 2500 years of history, the Dniester River forming the current border has been a traditional border between Slav lands (Scythia, 450 B.C.) to the East and Romanian lands (Dacia) to the West. In 1992 Moldova and Transdnistria fought a brief, bitter war which the separatists won, with the assistance of a contingent of locally-based Russian troops left over from the Soviet Red Army. Cease fire left Russian troops in place as peacekeepers and Transdnistria has since then acted de facto as independent – although not recognized – state. 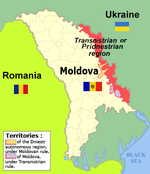 Transnistria region broke away in Soviet times because it feared Moldova would unite with Romania. Most of Moldova was once part of its western neighbour. Most of Moldova was once part of Romania and now there are growing social forces in Moldova seeking reunification with its western neighbour for nationalist reasons and as an easy path to EU membership. Already between 10% and 20% of Moldovans have Romanian, and by extension EU, passports. The fear of Romanian expansionism frightens Transnistria away from reconciliation, while the “Kosovo precedent” gives its arguments for independence more weight. In 2009 Romanian President Traian Basescu told the Romanian parliament that he would fast-track Moldovans for Romanian citizenship following riots in the Moldova (Source DW) . Fast-tracking citizenship to some 1m people next door in Moldova, in effect giving EU citizenship to a quarter of the population of Europe’s poorest state. d) persons without citizenship – around 20,000-30,000 people. In my opinion even without international recognizion Transnistria meets the requirements for sovereign statehood under international law, as it has a defined territory, a population, effective elected authority, and the capability to enter into international relations. It is currently seeking international recognition of its de facto independence and statehood. Conflict was frozen nearly ten years, then started first serious try to find sustainable solution. Internationally most used format has been sc 5 +2 process (Moldova and Transdniester as sides in negotiations, with Russia, Ukraine and the OSCE acting as intermediaries and the EU and the US as observers). Also 2+1 format (Moldova and PMR as parties, Russia mediator) has been used. In February 2011 the so-called “5 + 2 Talks” were started again in Vienna. More about negotiation history in my article Transnistrian number game . When Ukraine took on the rotating chairmanship of the Organization for Security and Cooperation in Europe (OSCE) this year, it pledged to make progress on Moldova-Transnistria conflict. However during negotiations on May 2013 in Odessa the hopes of a breakthrough appeared increasingly distant. The so-called 5+2 group was barely able to agree on an agenda for the talks, let alone negotiate a any settlement to this 21-year-old frozen conflict. Moldova and Transnistria have been close for solution by widely agreed sc “Kozak plan” which still is valid for further examination. In the Spring 2003 Dimitry Kozakin – a special envoy of Russian President Putin – started to broke deal between local stakeholders and finaally proposed on the creation of an assymmetric federal Moldovan state, with Moldova holding a majority and Transnistria being a minority part of the federation. Known as “the Kozak plan”, it did not coincide with the Transnistrian position, which sought equal status between Transnistria and Moldova, but gave Transnistria veto powers over future constitutional changes; this encouraged Transnistria to sign it. However when the plan was ready and preliminary agreed to sign on November 2003 the Western powers put some pressure towards Moldova leading to President Voronin’s rejection to sign. August 2008 was the turning point in negotiation process. Conflict in Georgia was in background when Russian President Medvedev first held talks with Moldova’s President Voronin and later with Transdnistria’s leader Smirnov. 5+2 format was replaced with 1+2 format including Moscow as mediator, Chisinau and Tiraspol as the parties of conflict. The basic elements of new deal are probably similar like in Kozak plan I. The price of reunion will be high to Moldova because probably federation form with strong minority or veto rules would neutralize Moldova’s foreign policy related integration towards EU and Nato. Higher price for Moldova could be even stronger sovereignty of Transnistria with thread that also other autonomous territory of Moldova – namely Gagauz region – would follow the steps of Transdnistria; it is expected that the demands of transforming Gagauzia region from autonomy to republic will increase. There is an opinion, that the Transnistrian conflict will be resolved if Moldova joins the Eurasian Economic Union (EurAsES or EAEC)where Moldova now has an observer status: “The Transnistrian conflict is soluble. When we all come into the EurAsES, all questions will be resolved”. However this option seems to be unrealistic. A new approach (joint initiative of Russia and Germany, Meseburg, 2010) by the EU and Russia to resolve the conflict could be the setting up of a joint Political and Security Committee (EU-R-PSC) at minister level.. Transnistria thereby became a test case for future cooperation with Russia. You are currently browsing the Conflicts by Ari Rusila blog archives for June, 2013.